Some of my friends has already known about this plan of mine because I have been talking about it. Some thinks it is too dangerous to do it, some thinks it is almost impossible, some thinks I am crazy. I want to travel around the world on my Vespa. 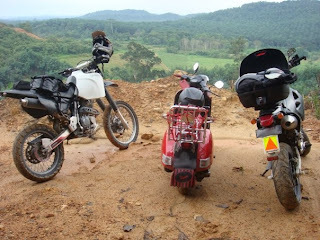 Long Way Round, Long Way Down, Ewan McGregor, Charley Boorman and their BMW GS Adventure may pop into your mind now. So the question always come, "Why Vespa? Why not BMW?" That is the power of consumerism and media influences have on people's opinions and decisions. I retorted, "Why not Vespa? Why must it be BMW?" After some research, I won't say it is impossible because these people have done it on Vespas and they did it without backup vehicles, some without sponsors. The most famous of all, the late Giorgio Bettinelli. He had accomplished what many could only dream of. 5 big trips on different continents, with his trusty PX and GT on his last trip in China. Sean Jordan, a Canadian working in Budapest. 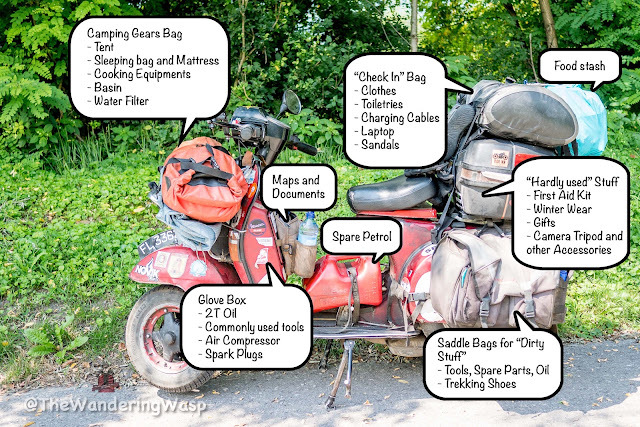 Vespa 360 project, the name of his trip, he started and ended at Budapest and covering all continents except Africa, Antarctica and Australia in 18 months. Drew, who rode from Adelaide, Australia to London from March 2011. It's a Vescapade. Mr Vespanda, I don't know his real name, I think he is an Italian. With his 40 year old vespa named 'Battleship', he covered 80,000km on the entire America continent, South, Central, North for 2 years. Vespa on the Roads of Asia. His blog is in French for most parts and also in English. I don't know his name but it is an interesting read. 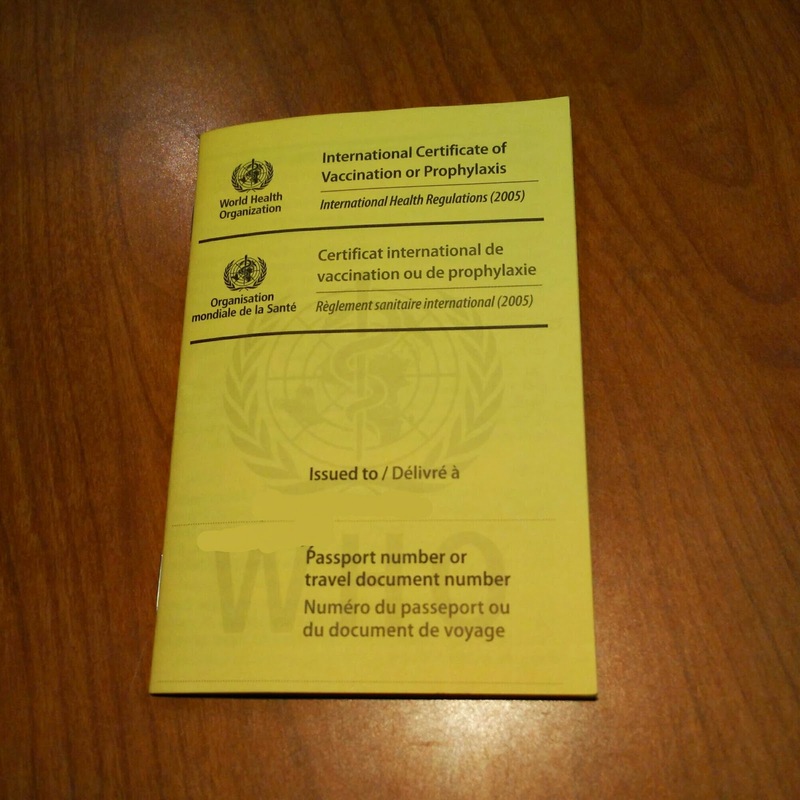 The last post sums up the best and worst part of the journey. He has his definition of adventure which could be fulfilled with a Vespa. "It is the rider, not the bike. "- Lawrence Tan. 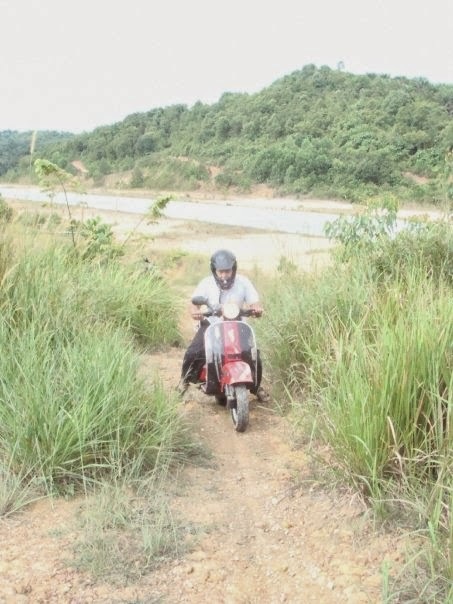 A late friend, Lawrence Tan was the one who catapulted all these motorcycle touring madness on unconventional bikes. 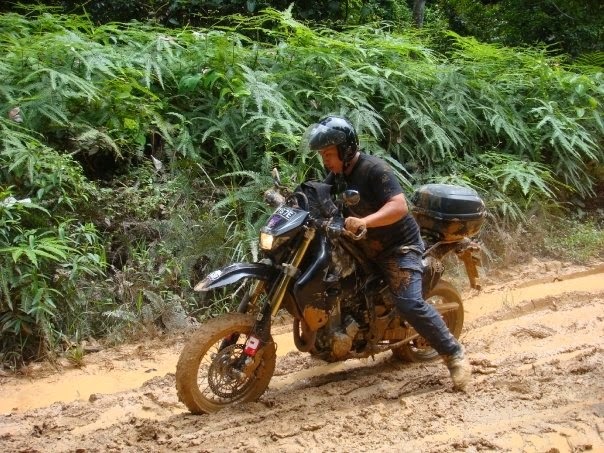 In end 2008, he pillioned his mother from Singapore to North Thailand on a DRZ 400 SM. He fully utilised his multipurpose DRZ - for commuting, touring and dirtbiking. Because of him, I also rode my Vespa on dirt and eventually got myself a proper KTM 200 for dirtbiking. When everybody told me that the KTM 200 is too high and powerful for a 1.56m me to handle, he convinced me otherwise. "Don't listen to what others said. It is just a matter of time getting used to it. You need more practice. It is the rider, not the bike." He was a man of mettle, ready for any challenges and adventures. I hardly hear him utter the word 'impossible'. At Nusajaya, Lawrence rode up this tricky upslope on my vespa. Lawrence and another rider friend Wei Jie, planned another ride to China border on their DRZ400 and XR400 respectively in mid December 2009. A week before they were to set off, I received the news that Lawrence passed on in a van accident. It took me a while to register the loss and break the news to Wei Jie. Nonetheless, a few weeks later, Wei Jie went ahead alone to complete the trip they planned together. 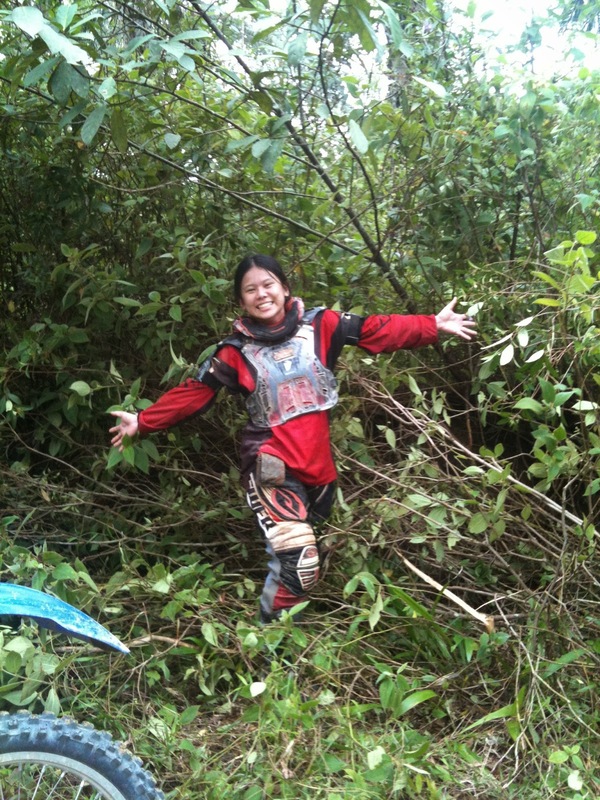 Dirt-venture with Lawrence and Wei Jie somewhere in Malaysia. Although Lawrence is no longer around, his zeal for adventure infected many others. Always in the planning for the next adventure, Wei Jie proposed a crazy idea about riding beyond Southeast Asia. Due to my small stature, finding the suitable adventure tourer bike has always been a challenge. Heck, I might as well go with whatever I have. Destination - Italy, the birthplace of Vespa. Plus, I have always been an Italophile. My Vespa, I call her Ebony Rouge, has been with me for 5 years. She is a scooter whose temperament I have come to understand pretty well. She is not recommended for extreme terrains, but her mechanical simplicity and prevalence over the world also means that repairs and parts are easily available. Her petite frame also takes up less space in cargo and help save freight cost. Her market value also means I don't have to pay tens of thousands dollars for Carnet de Passages (which cost at least $10,000 or the value of your motorcycle). After paying my final installment for uni tuition fee in May 2011, I started saving for the trip. Then, I met the Master! At Dr Tan Cheng Bock's photobook signing event, I parked next to an African-twin emblazoned with many signatures and stickers - an attestation to number of people this bike met and the number of countries it has visited. I did not have a box, so I carried my helmet up to the office where the booksigning was taking place. My helmet's presence struck up a conversation with a dark lanky gentleman who was a volunteer at the event. He asked me, "Eh, you ride bike ah?" "Yah, you are the one who rode around the world on your African twin, right? I parked next to your bike and recognised it." We continued chatting and I told him my plans. A new friend and Shi Fu was made. We call him Master Goh. He and his wife Samantha spent 2 years 8 months on the road. Their journey was chronicled on their blog Singapore Dream - Round the World. Master Goh and Samantha often hosted travellers. To them, hosting them is a reciprocal gesture for the hospitality they received during their trip. Sometimes, they would organise a gathering for aspiring bike travellers to discuss and share pointers for their future trips. I can see that they sincerely want others to also fulfill their dreams. I met one of Master Goh's guests, Mark and Sanne. You can follow their journey on Handful of Throttle. They have been travelling from Australia with their DRZ400E and they are vegetarians! I am a vegetarian too, so they shared how they managed their dietary choices in other countries. Sanne told me one thing that I remember vividly, "There will be many people who will try to talk you out of it. Don't let them." Like she said, I already have many friends who tried to dissuade me. The thought of leaving behind your comforts and living your days with many unknowns cringes many. I come to realise that even in our mundane days, there are still unpredictable situations happening. Just like how most of my friends never expect Lawrence to pass away in a accident driving a van when he had spent more time riding a motorcycle. Unless there is some vampire immortality curse/gift out there, let's face it, we are all going to die one day, it is just a matter of time. Each day we live, we have the higher possibility of getting into an accident, getting stricken with a disease. Everyday we live, we inch closer to our demise. The realisation about brevity and unpredictability of life struck me more especially after Lawrence's passing. Subsequently having friends and knowing people of my age who passed on in bike accidents, from cancer, from heat stroke, this realisation further intensifies. A friend shared an adage with me, "Coffin is for dead people, not just for old people." We have to accept that death can come anytime. Too often we have been caught up with living up to societal expectation, we became obsessed with surviving and forgot about about living. Get a good education so we can get a job and money, get a good boy/girlfriend so we can get a spouse, buy a house so we live in comfort, get married and have kids so we have someone to look after us when we are old. Many things we do is for a safety net in different stages for our lives. And when we are finally on our deathbed, we asked ourselves, have we truly lived or are we just surviving? Have we made a difference to the world or someone, or are we just scraping by? Subconsciously, we have been programmed to lead a life of security and comfort like this. However, I believe there is more to that. I often muse about the world and other parts of the Earth, how the people over there are like, how same or different are they from us, how they live. There are still tons for me to learn and in someway or another, I wish to contribute what I will learn to society. Probably not to start a revolution like Che Guevara after his motorcycle trip. Well, I really do not know for sure how travelling can change me. I am sure many of us has something in our heart that we want to achieve but it is fear that pull us back. I have my fears too. However, this insatiable curiosity in me is stronger than the fear of unknown. I guess that include losing fear of the unknown too. With this blog, I wish to pen down the trip preparation, the journey itself, my many musings about everything. Do enjoy.